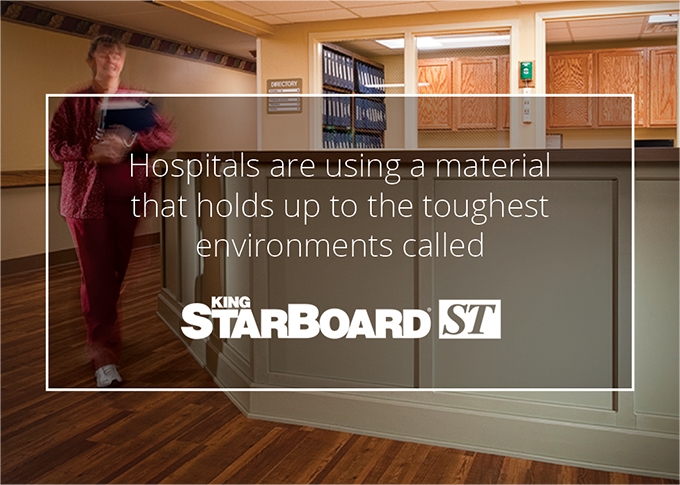 King StarBoard® ST is a special, high-density polyethylene sheet that provides a super tough surface for many applications in the healthcare industry. This unique and advanced polymer makes the material 25% stiffer than the original King StarBoard®. King StarBoard® ST is our most scratch-resistant polymer making it an excellent construction material for cabinetry, case goods and architectural partitions. It will not warp, rot, or delaminate when exposed to humidity or water. It can be fabricated using common woodworking tools and techniques. King StarBoard® ST is upgradable with King FlameShield, for ASTM E-84 Class A or B Flame/Smoke Compliance and CAN/ULC-S102 for Canadian Compliance.